I crave fast breakfasts that are filling and have more to them just oatmeal or whatever. But, it can be tough when you don’t have a lot of time. 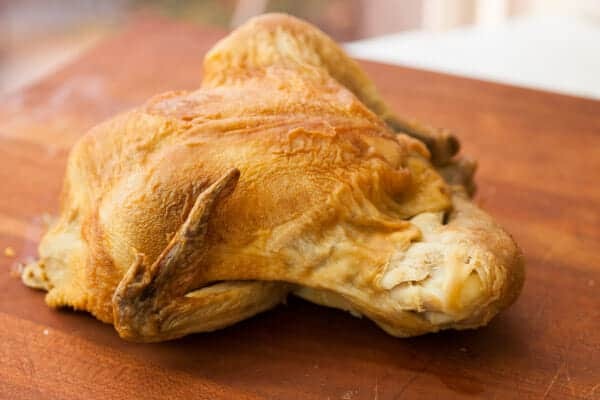 Enter of my favorite meal hacks: The Rotisserie chicken! 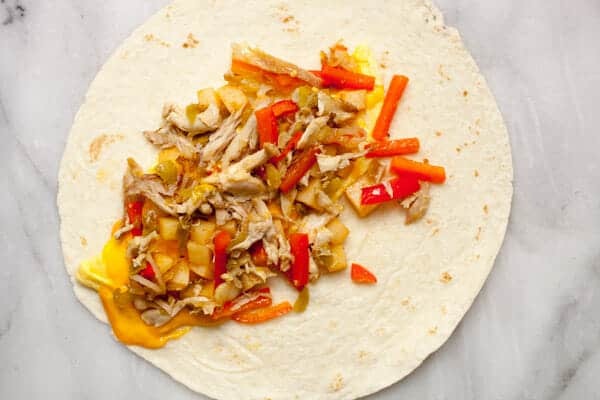 Buying a rotisserie chicken from your deli makes this chicken breakfast burrito super fast to make! I scaled this recipe to basically make one burrito, but of course, you could scale it up. I think you could probably get 8-10 burritos out of a single rotisserie chicken. Then you could wrap them in foil and freeze them for later if you wanted. It’s a pretty fast deal though so making one fresh isn’t that bad. If you’re a slow chopper, you could easily prep the stuff the night before for even faster burrito making! These super-cheesy and delicious breakfast burritos use one of my favorite meal shorted (rotisserie chicken). 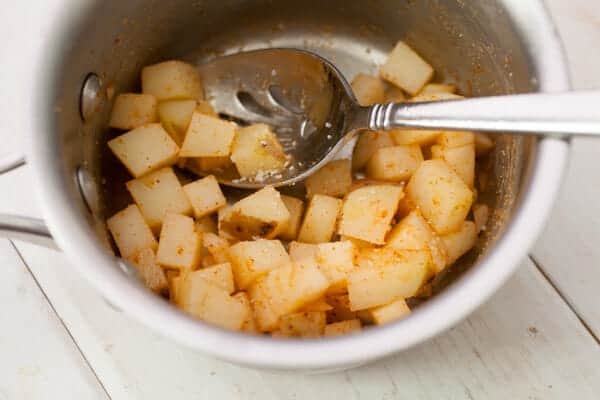 1) Cube potatoes into 1/4-inch cubes and add them to simmering water. Simmer until tender (6-8 minutes) and then season with seasoned salt. 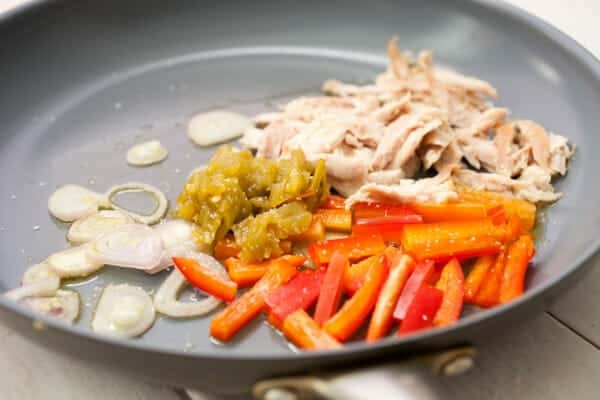 2) In a large skillet over medium heat, add a drizzle of olive oil along with shallot, shredded chicken, red pepper, and green chile. Cook for a few minutes until veggies soften. 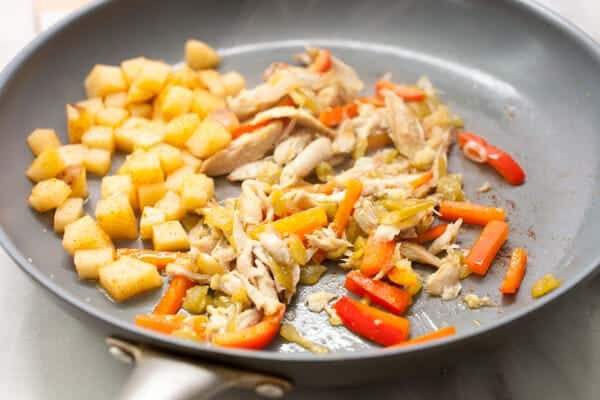 3) Stir together skillet ingredients and add cooked and seasoned potatoes to the skillet as well. Season filling with salt and pepper. 4) Whisk egg with one tablespoon of water in a microwave-safe bowl. Microwave on high for 60 seconds. 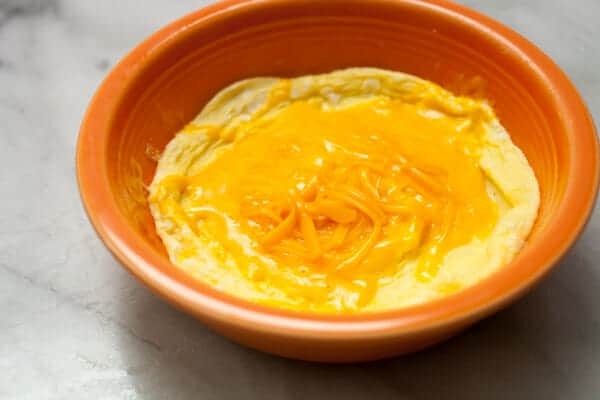 Remove and add cheese and microwave for another 10-15 seconds to melt cheese. 5) Transfer cheesy egg to flour tortilla. Top with fillings in the skillet. Roll up and wrap in foil or eat it immediately! I really like a few potatoes in my breakfast burritos. They just kind of round out the burrito. Of course you do need to cook them which adds to the prep time, but you can simmer them while you quickly saute the other filling ingredients. I cubed my potato pretty small and simmered it until they cubes were tender, 6 minutes or so. Then I drained them and seasoned them with a little seasoned salt. This is the real time saver of this recipe though: The Rotisserie Chicken! Shred up some of that and add it to a skillet over medium heat with a drizzle of oil, some red pepper, a shallot, and some green chiles. You can do this while you are simmering the potatoes! Once the potatoes are drained and seasoned you can add them to the skillet. Easy breezy! Speaking of breakfast, it wouldn’t be a breakfast burrito without an egg and some cheese right! I just whisked my egg with a tablespoon of water and microwaved it on high for 60 seconds. Then add the cheese and microwave it for another few seconds until the cheese is melted. Assembly is pretty straightforward. 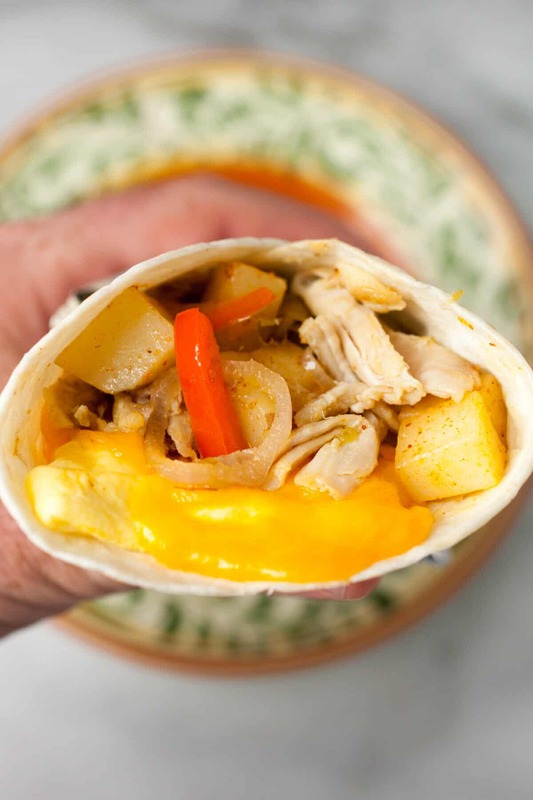 Transfer the cheesy egg to your tortilla and top with the burrito fillings! 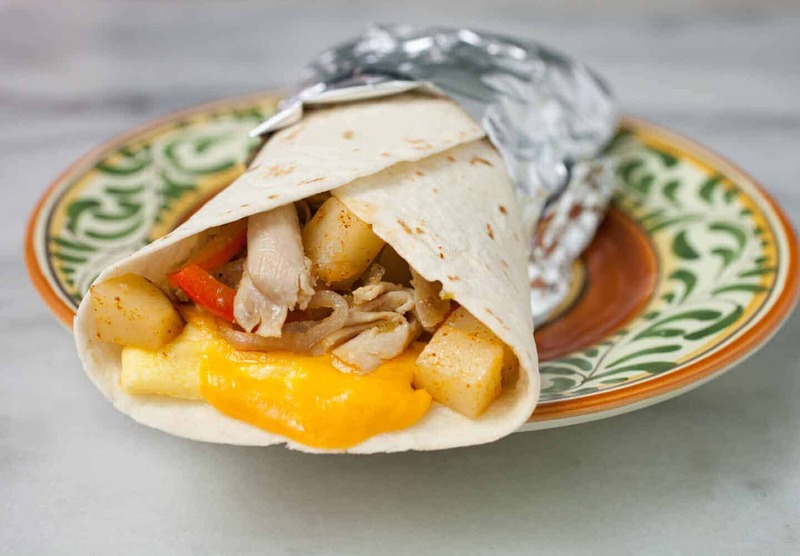 Wrap up your rotisserie chicken breakfast burrito up tight and you’re in business. Breakfast of rotisserie champions! This looks really good! I have some rotisserie chicken leftover so I might be giving this one a try really soon! Thanks for the great recipe. Going to give it a try, looks good got rotisserie chicken lunch meat from hills hire will that work? Should work fine! Good luck Joanie! It all sounded good till you got to the microwave part. I would have to cook them on the stove top instead. I cook nothing in a microwave.